Dec 05 2003 MDB series Measures only 1.375 tall X 1.160 long X .650 wide for all ranges (2.5, 5, 10, 25, 50, 75, and 100 Lbs. full scale). 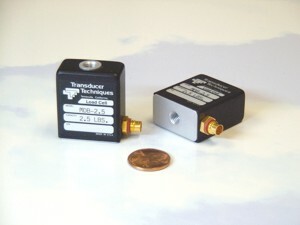 They are offered standard with a mini gold pin connector system with10', 4 cond. cable. MDB Series was designed to help fill the need for a greater selection of high accuracy load cells for use in space limited applications. The MDB’s are compliant in tension and compression, therefore a good choice for in line through zero applications, as well as single direction tension or compression. Combined accuracy of non-linearity and hysteresis is 0.1% of full scale or better, and non repeatability is .05% FS. Output is 2 mV/V nominal via full wheatstone strain gage bridge of highest quality. Load cells are supplied with calibration certificate traceable to National Institute of Standards and Technology.